system for more efficient service. We also provide out-of-town service. 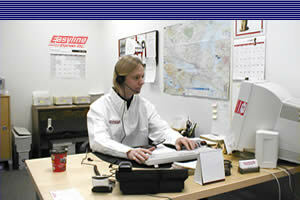 Delivery times are restricted to the Toronto area, outside Toronto delivery times are extended up to 30 minutes. Direct door to door available upon request. Picked up and delivered within 120 minutes. Picked up and delivered within 4 hours. or shape cargo. Do not hesitate to call us. Regular mail-runs to and from the post office. Cheque Certification and bank runs. Delivery of time-sensitive material, (i.e. tender documents). Pick ups and delivery of parts and supplies for your business. Weight: $ .05 per lb. over 30 lbs. Waiting Time: For any delivery that requires a driver to wait at pick up or delivery, a charge of $ 5.00 per 15 minutes or part thereof will apply. Delivery times are restricted to the Greater Toronto Area (GTA), outside the GTA delivery times are extended up to 30 minutes. Mississauga, Richmond Hill, Scarborough and Woodbridge.